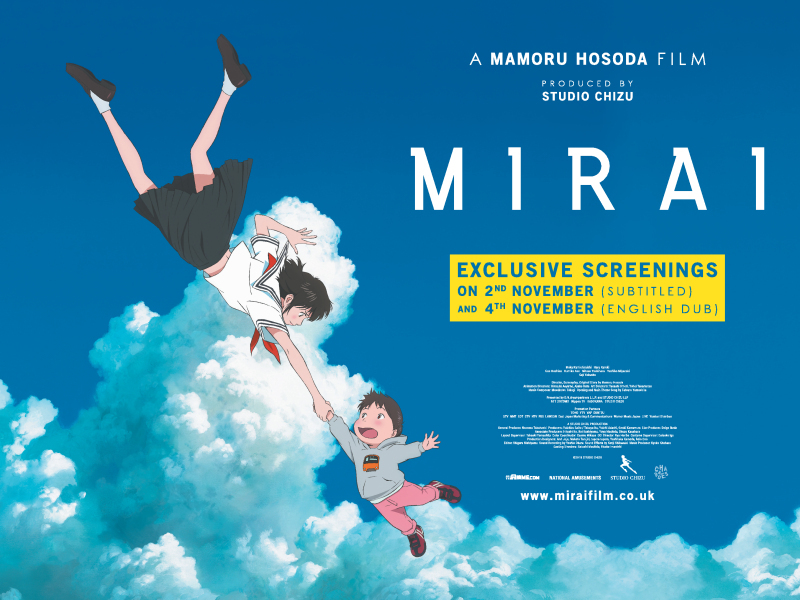 With the UK theatrical release of Mamoru Hosoda’s latest film Mirai just over a week away, we know many of you have been waiting for news about the film’s English dub cast. Well, this afternoon we’re delighted to reveal a trio of stars that will be voicing characters within the film, to give you a flavour of how you can expect the film to sound in its English presentation come November 4th! Read on below for the full press release to find out the details, and don’t forget hat the film hits UK cinemas in its Japanese presentation with English subtitles on November 4th, with selected cinemas screening both versions of the film into the following week. October 25, 2018 – GKIDS & Anime Limited have announced the English voice cast for MIRAI, a daringly original story of love passed down through generations. The film will feature the voices of John Cho (Star Trek, Searching), Rebecca Hall (The Town, Christine), and Daniel Dae Kim (“LOST”, “Hawaii Five-0”, “The Good Doctor”, 3AD Media). Mamoru Hosoda, the celebrated director behind The Boy and the Beast, Wolf Children, Summer Wars, and The Girl Who Leapt Through Time, wrote and directed the critically acclaimed Japanese animated film that world premiered at Cannes Film Festival, and additionally played at BFI London Film Festival and the Animation is Film Festival in Los Angeles. Mirai will open in cinemas across the UK & Ireland from November 2nd with Dubbed screenings playing from 4th November. Selected cinemas will be screening both the subtitled and dubbed versions throughout the following week. Synopsis: When four-year-old Kun meets his new baby sister, his world is turned upside down. Named Mirai (meaning “future”), the baby quickly wins the hearts of Kun’s entire family. As his mother returns to work, and his father struggles to run the household, Kun becomes increasingly jealous of baby Mirai… until one day he storms off into the garden, where he encounters strange guests from the past and future – including his sister Mirai, as a teenager. Together, Kun and teenage Mirai go on a journey through time and space, uncovering their family’s incredible story. But why did Mirai come from the future? We can’t wait for you to hear this English dub yourselves, and we look forward to hearing your thoughts on Mirai when it arrives in cinemas next week! I’m assuming you guys also made the mirai site, pressing “Trailer” at the top doesn’t remove the map if you pressed tickets beforehand. Also, will it not be shown with subs in the UK? We don’t see that issue here! And yes, we’re also screening the film in Japanese with English subtitles – these screenings will take place on November 2nd, with further screenings at selected cinemas during the following week.